Fikus for lathe application offers a flexible and functional solution for today's toolmaker, and it not dependent on the age or type of the lathe in use. Fikus for lathe is specifically designed to be quick and easy to use, using a range of innovative tools. The product is a Windows 32-bit native application, with dynamic OpenGL rendered graphics, and user interface with clear and concise icons and toolboxes, making the learning process easy. The major machine manufacturers are implemented with optimized technological tables. Fikus enables the creation and modification of required geometry, as well as importing geometry from other CAD systems via IGES,DXF or PLT. In addition, it provides an unlimited undo/redo, intelligent trimming, print with preview, as well as specific gear creation functions. The Fikus Path Manager allows for easy creation of lathe procedures. This procedure is a combination of geometric and technological data presented in a logical tree, easy to create and edit at any stage in the process. The set of procedures may be saved as a template and applied to other geometries at a later stage. features - copy, cut, paste, drag and drop. Fikus for lathe offers a complete solution for machining parts with a lathe NC. During the creation of the part, the user can visualize it as a solid rendered object and dynamically pan, zoom or rotate it using the OpenGL standard graphics operations. Changes made (height, draft angle, or synchronizing the contours), are automatically shown on the screen. View manipulation can be performed during toolpath simulation. Fikus is an application that provides a solution for programming lathe NC's, which assist the user in producing complex toolpaths quickly and efficiently. Customized tables for each machine, help to obtain accurate G-codes and allow the user to work in a familiar environment. Fikus automatically detects different geometries to apply the adapted technology. 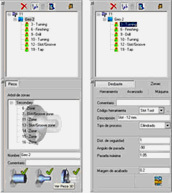 The user can select roughing or skimming passes, while the application sets the required parameters and automatically creates the appropriate toolpaths. Multi- contour selection is enable " by window " and the application detects islands and closed and open contours. Fikus is a robust, flexible and easy-to-use application designed to reduce overall programming time and ultimately, improve the machining capabilities of the lathe NC.